I know today is not Monday, but I am going meatless because I am obsessed with this vegetarian wrap sandwich! Besides, who needs meat when you have all these amazing flavors? You can tell I am proud of them because of the long title I chose for this recipe. Could I call it just Chipotle Veggie Burger Wrap Sandwich? I suppose I could. However, the sweet corn relish and the roasted garlic aioli are so marvelous that I decided that they deserve a place in the spotlight! 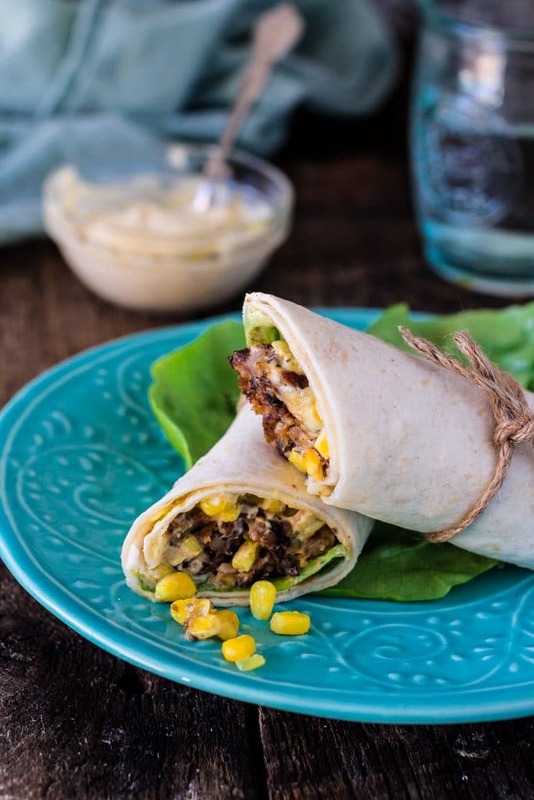 This wrap sandwich is not only delicious but very convenient on the go. In fact, I wish I still had some to bring with me to work today, because I worked all day on a dessert recipe and by the time I realized I was hungry, there was nothing savory or nutritious to eat. Boooooo! ? And although I sometimes say I could live off cake, that is not entirely true. I do need my occasional protein too! Good thing there’s plenty in this wrap! One thing I’ll say about this recipe: it can be a little time consuming to get all the parts done before you assemble the wrap sandwich. It is VERY worth it though! To make your life easier, I highly recommend you make a big batch of both the sweet corn relish and the roasted garlic aioli because you can have it in your fridge and use it for everything. Wraps, burgers, tacos, you name it! 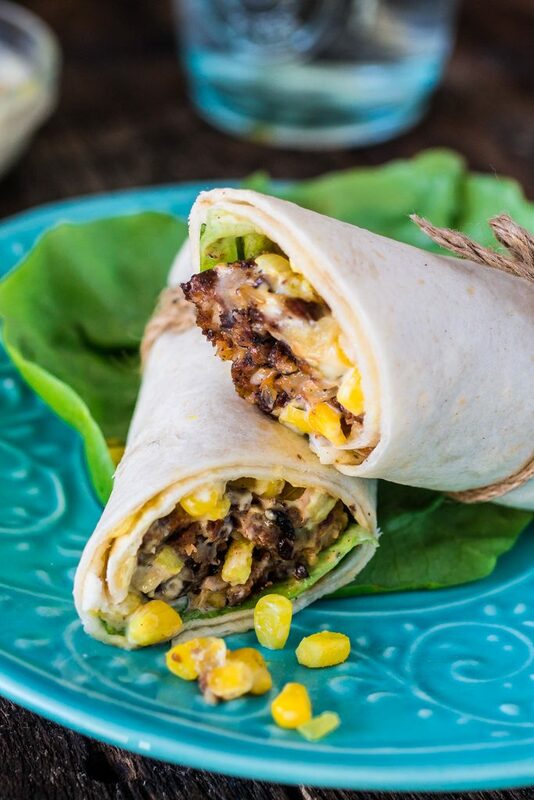 And it will save you all the time – and dishes – for when you decide to make this Chipotle Veggie Burger Wrap Sandwich. Funny story: Tim got home the other day, when I had just worked on this recipe, to a very messy kitchen. As in, “OMG! Did a hurricane just hit this apartment?” kind of messy kitchen! Then he went to my photography set and saw the wraps and started laughing. He apparently thought, after seeing the kitchen, that I had cooked food for an army. Nope! Just two sandwich wraps. But then he took a bite and immediately understood the complexity of the flavors. And it was love at first bite! I mean…Stop everything!!! My meat lover husband feel in love with a vegetarian wrap, ladies and gentlemen! There is definitely still hope in the world! ? Now, I think you’d be happy to know that making a black bean burger from scratch is not necessary here! Why? Because Gardein already made an awesome one for you! Phew! 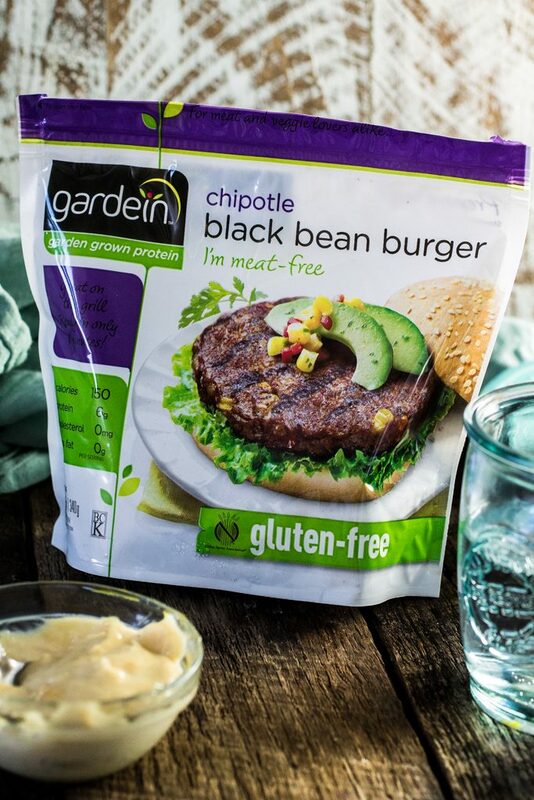 Their Chipotle Black Bean Burgers are made with a savory blend of black beans, brown rice, corn, and bell peppers. And, in case you’re wondering, the Chipotle flavor is not overpowering at all! They also have 50% less fat than a regular beef burger and are ready in 8 minutes! Oh and they are a great source of fiber and are gluten free! I am no vegetarian, but I can totally see how my life as one – if I ever decide to go down that path – would not be hard, especially when there’s a company like Gardein out there, using the power of vegetables to create good, fast and convenient food! Are you very excited to try Gardein? Or maybe you are a long time customer! Either way, Gardein is giving you a $1 off coupon so you can grab something delicious. Enjoy! This recipe makes 2 wraps, but you will have some extra aioli and maybe extra relish, depending on how much you add to your wraps. So I would just go ahead and make 4 wraps! You never know when you will be hungry and need something on the go. 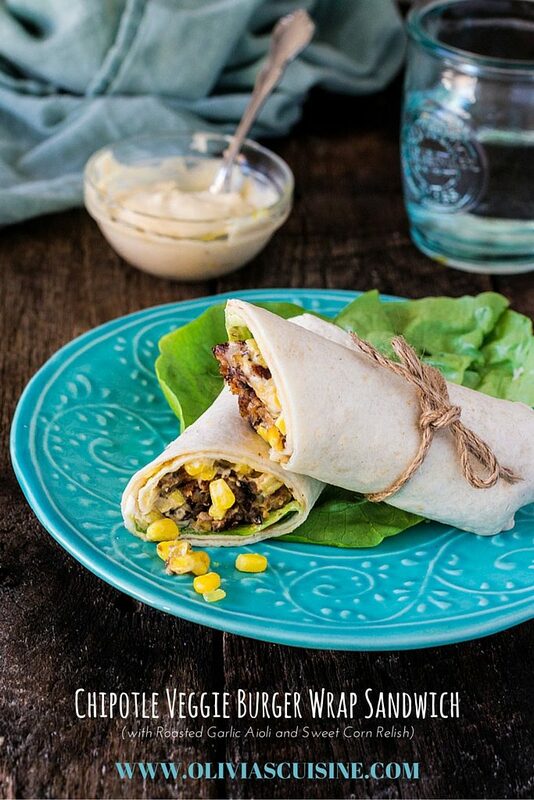 Believe me, you will be very thankful that those wraps are waiting for you in your fridge! ? Have a great weekend, guys! And don’t forget to grab your coupon. Heat the oil in a saucepan, over medium heat. Sauté the shallots for about 5 minutes or until softened and translucent. Add the remaining ingredients, except the cilantro, and bring it to a boil. Cook for 5 to 10 minutes or until the corn is golden and the sauce coats the kernels. Add the cilantro and reserve. Pre heat oven to 425F degrees. Cut the top of the whole heads of garlic to expose the garlic cloves. Place on a sheet of foil, drizzle with olive oil and season generously with salt and freshly ground black pepper. Wrap up the foil into a pouch and place it in the oven to roast for 35 to 45 minutes. Remove from oven and allow to cool. Then, squeeze the pulp from the skins and transfer to a food processor. In the food processor, combine the garlic pulp, the mayo, lemon juice, Dijon mustard, Worcestershire sauce and cayenne pepper, if using. Season with salt and pepper. Pulse until smooth. Refrigerate until ready to use. Lay the tortillas on a cutting board and start to layer the ingredients in the center of the tortilla, leaving a 1-inch border at top and bottom. Start with a few leaves of lettuce, then the chopped black bean burger, sweet corn relish and finish by drizzling the aioli. Fold in tops and bottoms of wraps by about 1 inch, then roll tightly from one of the open sides to enclose filling.Wrap tightly in plastic or waxed paper. Refrigerate until ready to serve, up to overnight. What a fabulous post using gardien patties.